Magnetic resonance imaging (MRI) uses a powerful magnetic field, radio waves and a computer to produce detailed pictures of the body’s internal structures. The images from MRI exams show much more detail about soft tissue structures than x-rays or CT scans. While the exams take longer to perform, MRIs often allow diagnosis and characterization of body parts and diseases that are not possible with other imaging modalities. These include evaluation of the brain, neck, spine, abdomen and pelvis, joints, breast, and heart. They also provide detailed information about soft tissue conditions such as tumors and infections. 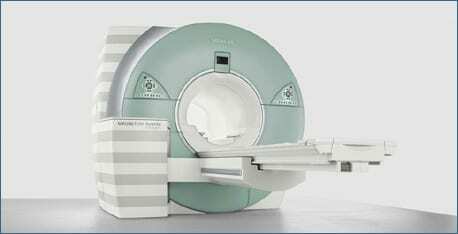 MRI is noninvasive and does not use ionizing radiation. Patients who might have metal objects in certain parts of their bodies may also require an x-ray prior to an MRI. You should notify the technologist or radiologist of any shrapnel, bullets, or other pieces of metal which may be present in your body due to prior accidents. Foreign bodies near and especially lodged in the eyes are particularly important.